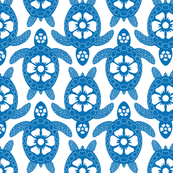 In the last two tutorials I showed how to make a seamless repeating pattern in Photoshop Elements. In this one I’ll show a quick way to make half-drop repeats. Half-drop repeats add a diagonal line to any pattern, such as the polka dots shown below. 1. For this repeat to work, you really need a solid co lor in the background, and you don’t want parts of the image touching an edge. I’ll start with this basic tile. Its size is 200 pixels by 200 pixels. 2. To create the half-drop, we need to add a duplicate tile and then offset it. So, the first step is to double the width of the ‘canvas’. This is done from the menu: Image –>Resize –>Canvas size, and then the box shown below pops up. In the “new size” section, if you set the measurement to ‘percent’ (circled in yellow), then make the width 200 percent. Alternatively, you can set the measure to ‘pixels’ and set the width to twice as wide as the current size. In the “anchor”area (yellow arrow), click so that the box looks like that shown below. This will put the original tile on the left side of your new canvas. This is what the new canvas looks like in Photoshop. 3. Next, duplicate the layer (from the menu: Layer –> Duplicate Layer), and then offset this new layer. From the menu: Filter –> Other –> Offset. For the horizontal offset, enter the full width of your original tile (200 pixels for my tile). For the vertical offset, enter half of the original height of your tile (100 pixels in my example). Shown below is the Offset dialog box and then the resulting tile. 4. From this, you can define your pattern and create the repeat (see Tutorial 1, step 6 for directions). This is the resulting repeat. 5. One of the fun things you can do is add designs to the tile created in step 3. Here I’ve drawn in some additional elements. When I put this tile into a repeat, the new elements will repeat in a straight repeat while the original elements are in a half-drop repeat (compare the repeat of the blue star to the pink circle). The repeat is shown below. Also, with this method, you aren’t limited to creating half-drop repeats. In step #3 you can specify the vertical offset to be any portion of the vertical size…1/3, 1/4, etc. Here’s an example where I recently used a half-drop repeat. Starting with the crazy Kauai rooster photos from the previous post, I removed the background and hand colored the birds in funky colors. I call this Kauai Breakfast because it reminds me of breakfast on the beach in Kauai, surrounded by roosters and hens.